Based on findings published in the 2015-16 Population Status Report for the pink-footed goose the Danish Wildlife Management Council has recommended that the hunting season for pink-footed geese in Denmark should again be extended to January, in 2017. In May 2016 the pink-footed goose population size was estimated at 74,000 individuals as detailed in the 2015-16 Population Status Report, published by the Danish Centre for Environment and Energy (DCE). The report provides an explanation for the low estimation given in June 2015, where it was reported that the population had declined considerably to 59,000 individuals. This made it necessary to reduce hunting pressure for the 2015-16 hunting season, by revoking the previous year’s January extension of the pink-footed goose hunting season in Denmark. Furthermore, temperature conditions on Svalbard in May 2016 were very favourable. This suggests a good breeding season for 2016. Hence, the optimal harvest for the forthcoming hunting season is predicted to be 25,000 pink-footed geese. The harvest strategy for the 2016-17 hunting season is reported separately on this website. In accordance with an agreement made within the International Working Group, Denmark and Norway are to share the overall harvest 70/30. This means that in Denmark it will be possible to shoot 17,500 pink-footed geese in 2016-17. Based on these findings the Danish Wildlife Management Council recommended that the pink-footed goose hunting season again be extended to January, for the forthcoming hunting season. 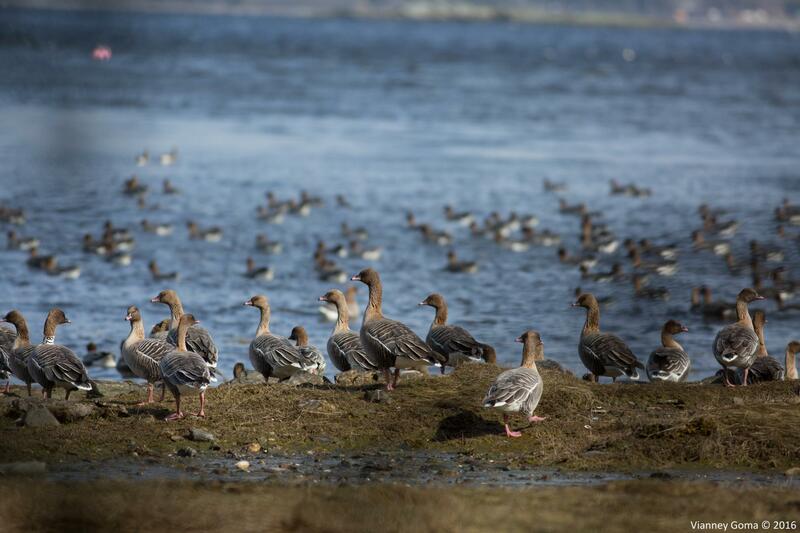 As the annual hunting strategy is sensitive to changes in population sizes, there has been additional focus on improving the pink-footed goose population estimate. Both in November 2015 and May 2016, coverage of the census count was extended considerably, with local counts organised in new areas in Sweden, Germany and Finland, as well as in Norway and Denmark. For details please see the 2015-16 Population Status Report. In addition, an alternative method for estimating the population size has been developed. Since 1990 Aarhus University / DCE has been capturing and neck-banding pink-footed geese. Based on intensive observations and neck-band readings the population size can be estimated (capture-recapture method). Initial analyses show that this alternative method provides population estimates that are in agreement with the counts. Details of this work will be published and made available on this website after scientific review. The Danish Centre for Environment and Energy (DCE) has published a press release (in Danish) with commentary on the population status and its implications for the 2016-17 hunting season in Denmark. The press release can be found on the Aarhus University DCE website here.